This is so easy you're going to laugh. Go ahead - you may as well start now. It takes a bare minimum of ingredients and just a little patience to make your own alcohol-based herbal tinctures. We'll be looking at different tincture uses in upcoming posts, but for now, let's start a batch! Although you can mix and match herbs any way you want in your tincture, I personally prefer making a separate one for each herb, and then mixing and matching the resulting tinctures. Make sure all your containers are both clean and sanitized prior to use. How Long Does an Alcohol-based Tincture Last? A tincture can last up to 2 years depending on the herbs and the proof of the alcohol (at least 40% is recommended). There are dozens of possibilities! Everything from home remedy sore throat solutions to topical use is possible – it all depends on the characteristics and properties of the herb used. The tincture in the above photo is going to be incorporated into a new skin tonic idea I've been working on. The herb I'm using is mallow (upcoming blog post on that soon). Stay tuned for more tincture fun! Have you ever made a tincture? What did you use it for? Thanks for the recipe. Will definitely try making this. Quick question- how can one tell if the tincture has gone bad, or will no longer be effective? A tincture will 'loose power' over time and it is a gradual process. Even though they can last up to 5 years, I have never used one older than 2 years. If you do the 'nose test' of a 2-year-old tincture next to a freshly made one, the difference will be evident. As to going bad, your nose is a good indicator for this as well. Truth be told, I've never had a tincture go bad. Hi Zan - Rubbing alcohol is not a good idea.This is going to dry and irritate the skin Is there some reason you don't want to use vodka? You could also use a brandy. Or even apple cider vinegar as an alternative? Let me know what the end use is going to be and maybe I can give you some more suggestions. Thanks for your response. The reason that I can't use vodka is because it is illegal for a Muslim like me to buy drinking alcohol in my country (Malaysia). However, I am currently pursuing my study in Australia and I can't find Everclear here (I guess it is illegal or something). HI Zan - No worries - your tincture made with white vinegar or apple cider vinegar will be equally effective. Have fun with it, and do let me know how it goes! Hey there Allanag92 - This is a good question. To be quite honest, I've don't believe I've ever heard of a tincture going bad, nor have I experienced it myself (and I have some tinctures up to 8 years old still in stock). If you used dried herbs and 80-proof alcohol, you are looking at up to 5 years of 'life' in your tincture. My best advice to you is to do the regular 'nose test' and if the scent changes (trust me, you will notice), then consider dumping it. I'm extremely nee to tinctures and there is information I can't seem to find. We made all kinds of herb tinctures using 80 proof Jenkins vodka. The two we filtered and bottled today were Hot & Spicy Oregano and Thyme. I've never used tinctures so I have zero experience with them. Is it normal/natural for the to smell like I dunno fermented plants? They don't smell like herbs to me. They smell like decomposing plant matter though. Got a headache bottling them. I plan to use some myself and gift the rest. I don't want to give anything that isn't safe to friends nor do I want to consume anything that isn't safe for me. How do I know if the powerful smell is just powerful medicine or something gone wrong? Hi Laura, From your description it does sound like something isn't right. There are more possibilities, so without knowing your exact process, it is hard for me to give you any real useful advice. The fact that you got a headache just from bottling them sounds very worrying. I would probably discard everything and start again. Sorry to be the bearer of bad news, but it's probably a better choice than using something that will make you ill. Best of luck with it! Is it ok to use grain alcohol (100% proof) instead of 80% since that is the only thing I can find where I live? Hi ksd - that should be fine - go for it! Hi Lise, I an extremely excited after I saw that you can make tinctures using apple cider instead of alcohol (I formulate for rosacea so alcohol is a big NO). I want to use powdered extracts of licorice, green tea and horse chestnut (3 separate not together), my question is what would the proportion be in this case, still the same or less herbs? Hi unknown - thanks for your input. Using a powder to infuse into vinegar is a titch tricky and may require a few small test batches tbefore you know how much swelling you get from each powder. You'll need some good filtering equipment and patience when you're tincture is ready for straining. 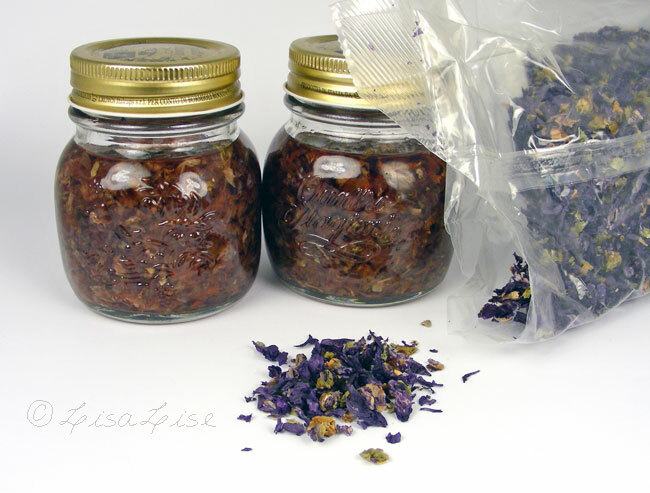 As for proportions: you will have to try out a few batches to see what works best for each herb, but try starting with 1:4 parts herb powder to liquid. Best of luck with it! thank you, I will try...what would be the % in a leave on topical product afterwards, 1%?